Pics and Kicks: My Fondest Dreams. 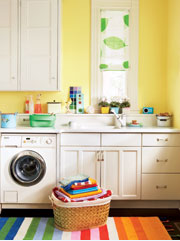 Real Simple has created the laundry room of my heart's fondest dreams. I saw it, I love it, I gotta have it, ok maybe in years to come, but one day I will have my laundry room of my dreams!! Love it! Actually, It kind of reminds me of your mom's laundry room! Oh Wow--I'd love this laundry room. Maybe I'll paint mine?? ?